For me, French Polynesia always existed in some kind of fantasy world. A place so beautiful and exotic couldn’t possibly exist, and if it did, it couldn’t possibly be a place where I’d be able to visit in my lifetime. It just seemed too good to be true, and a dream I always thought I’d be chasing. Even if you’re not a surfer, I’m sure you’ve heard of the famous Teahupo’o – a small village on the south-east coast of Tahiti. Here exists one of the craziest surf breaks in the world and the spot where the World Surfing League holds the Billabong Pro Tahiti each year. In fact, we were there for the surf competition in 2017 – how cool is that? 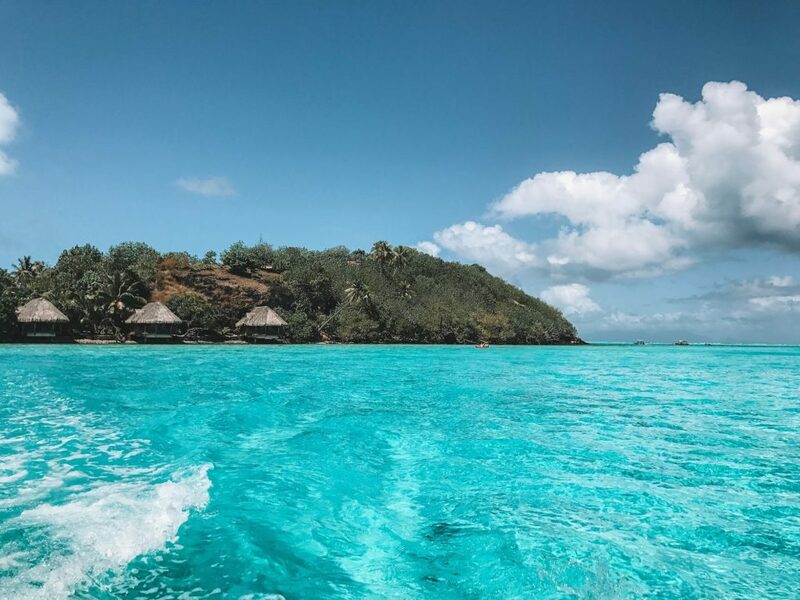 Nothing can prepare you for the insane view of the island of Tahiti when you take a boat out to the channel to watch the waves break; it is absolutely breathtaking. The tall peaks of the deep green mountains poke high above a wispy layer of cloud, giving some serious Jurassic Park vibes. The lagoon is clear, blue and teeming with marine life; dolphins will often pop up beside your boat to say hello as you journey towards the channel. Slowly diving around the boat, the dolphins seem like they’re greeting you and welcoming you to their part of the world. When we visited, the dolphins of Teahupo’o hung out in the exact same spot all day just offshore on the way to the channel, taking their job as official greeters very seriously. Watching the surf break is also an incredible experience worth visiting French Polynesia for; there’s something amazing about the power of the water as it crashes over the shallow reef break, and the feeling of watching someone take on one of the mighty waves leaves you breathless as you watch and wait to see if they’ll ride it out or get enveloped in the whitewash. 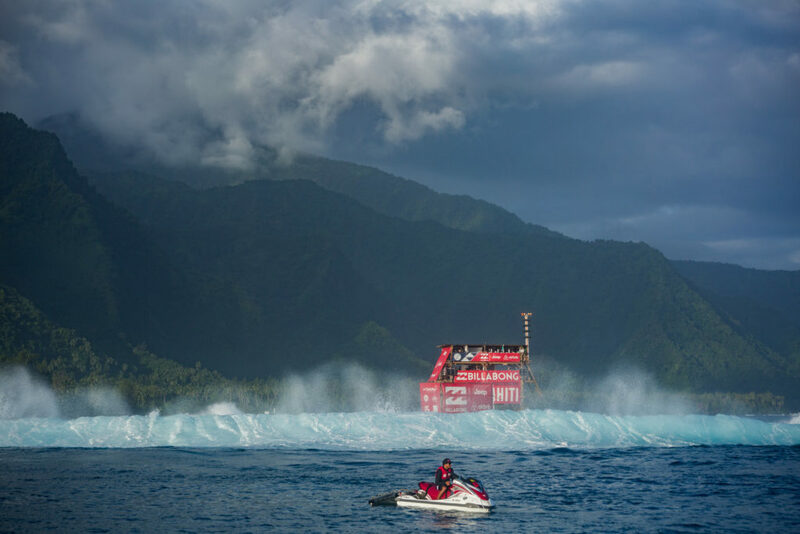 Watching some of the world’s greatest surfers ride the waves of Teahupo’o was an unbelievable experience too – how many international sporting events can you get that up close and personal with? If you’re brave enough, one of the best places to watch the waves isn’t from the boat, but from the water itself. One quick jump into the blue and you have a dolphin’s eye view of the surfers riding the giant walls of water – incredible! One last thing – if you’re planning to head to Teahupo’o on your visit to French Polynesia, I would highly recommend a stay at Vanira Lodge. Set upon the side of the green, jagged mountains, Vanira Lodge offers spectacular views of the Pacific Ocean (especially during sunset). It is also really close to the surf break at Teahupo’o, making it the perfect spot to base yourself during your trip. Most people assume that when it comes to a tropical island getaway, all there is to do in sit back, relax and drink as many pina coladas as possible. While this is absolutely something you can do (and enjoy very much), it certainly isn’t the only activity available. In French Polynesia, you’ll find plenty of awesome things to see and do on each and every island. 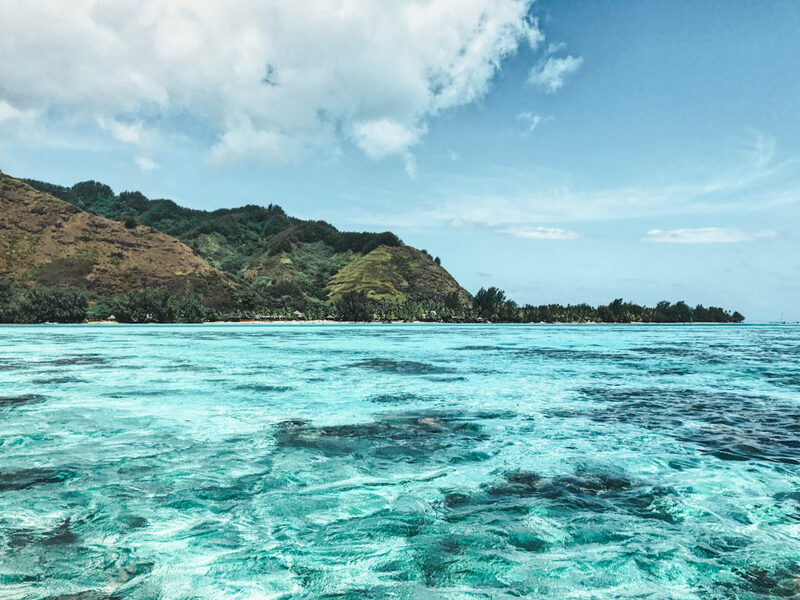 For those looking for adventure, look no further than the island of Mo’orea. Just a short ferry or plane ride from Pape’ete on the main island of Tahiti, Mo’orea is the perfect place for a bit of action! From zooming through pineapple plantations in the middle of the island on a quad bike to getting out in the lagoon to swim with the sea life, there is no shortage of activities to occupy your time. For those who are into hiking, you’ll have your pick of trails in Mo’orea. Hike at the foot of volcanic craters or admire the incredible view from Belvedere Lookout. 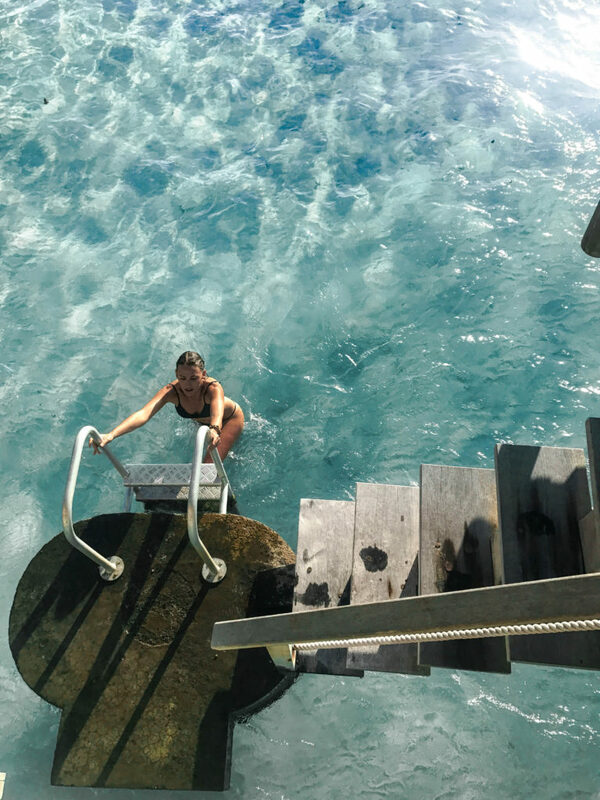 If the ocean is more your vibe, then that blue, sparkling lagoon is teeming with adventure. Explore tiny atolls just off the shore or paddle a kayak through the crystal-clear water on the lookout for blacktip reef sharks and stingrays. During whale season, you can also head out on a boat and swim with humpbacks and pilot whales in these gorgeous French Polynesian waters. Don’t worry, if adventure and fast-paced activity isn’t your style, there are still plenty of beautiful beaches and luxurious resorts on all the islands throughout French Polynesia where you can spend your time lazing by the lagoon or pool, with nothing to do but finish your book and order another cocktail. There really is something for everyone! Did you know that the very first overwater bungalow was built in Tahiti over fifty years ago? Since then, the famous overwater bungalow began to appear in other tropical paradises around the world, each one more lavish than the next (seriously, you should see some of them, they’re insane). 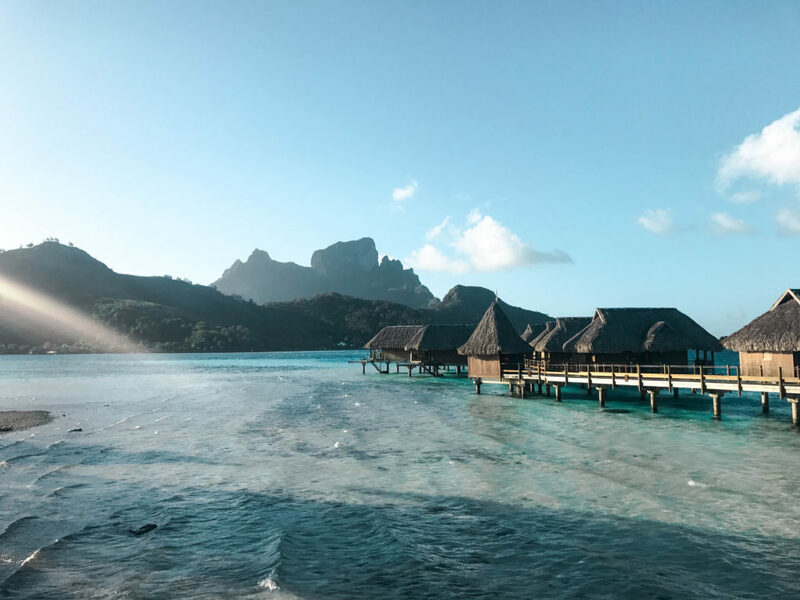 While there are many resorts in French Polynesia that offer overwater bungalows as a room option, it was on the stunning island of Bora Bora that we experienced one for the first time. Staying at the Sofitel Bora Bora Private Island, we were treated to unrivalled luxury in what I believe that possibly their best overwater bungalow. We had uninterrupted views of the sunset over Mount Otemanu, a pristine lagoon right on our doorstep, and a bottle of champagne to pop in celebration of visiting the number one place on my bucket list! When visiting French Polynesia, it really is worth staying in an overwater bungalow just once, even for a night or two. There’s something extra special about doing it in the place where the concept was created, and once you see that sparkling lagoon with your own eyes, you’ll see exactly where the idea came from. We were actually there during the 50th anniversary of the first-ever overwater bungalow, which was super-duper special. I will warn you though – good things do not come cheap, and an overwater bungalow is no exception. Despite being a more expensive option, it really is the perfect way to splurge and treat yourself at the end of your trip! When a place is surrounded by pristine lagoons teeming with marine life, you just know that you’re in for a treat when you enter the water to go snorkelling. I will never, ever tire of the continuously changing shades of blue that the South Pacific, and French Polynesia in particular, is famous for, nor will I tire of seeing the ever-changing landscape of the underwater world. 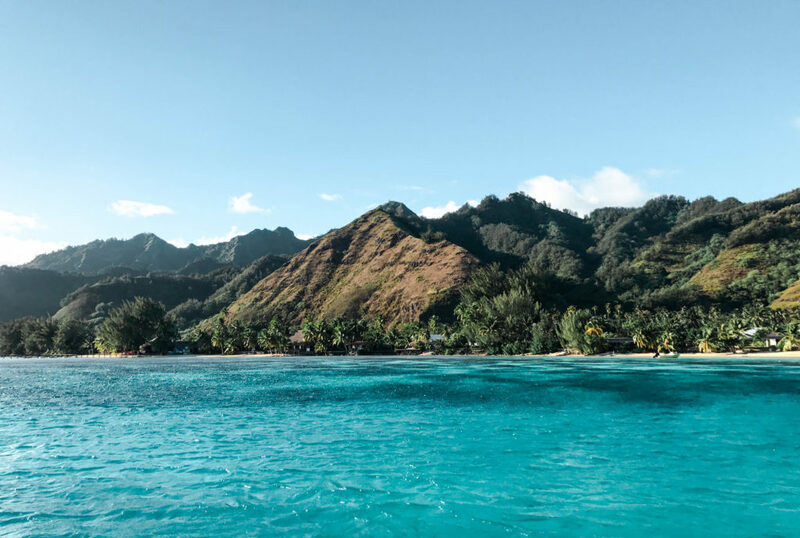 Jumping in to snorkel in the lagoon surrounding the island of Mo’orea is incredible; the water is crystal clear, the fish are plentiful, and it won’t take long until you’re up close and personal with the locals. 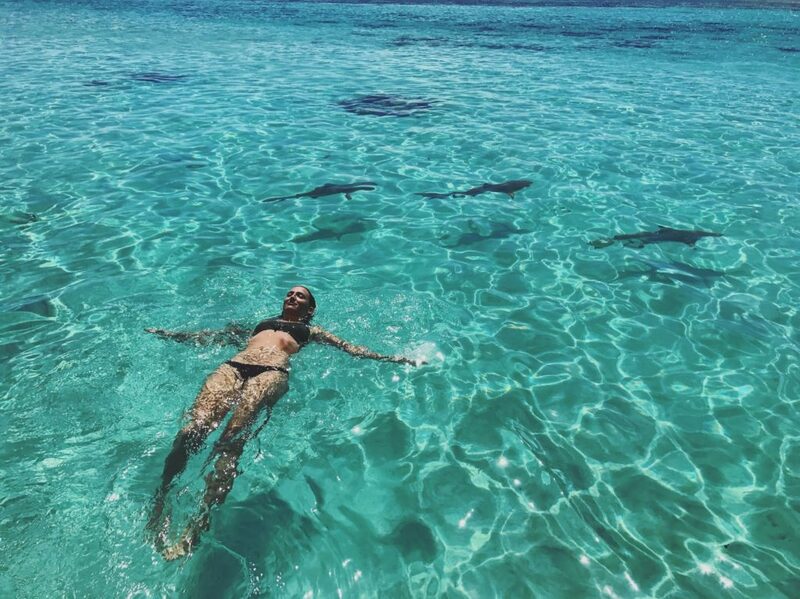 By locals, I mean the cheeky stingrays and blacktip reef sharks that patrol the lagoon. Don’t worry though, they’re very friendly – in fact, sometimes a little too friendly! In Bora Bora, the water is just as beautiful. Behind the Sofitel Bora Bora Private Island is a coral garden so stunning that local tours bring boatloads of people to the very spot to go snorkelling. As for us, we were lucky enough to just have to swim around the small island to access it whenever we wanted. Here, the deep blue water was full of colourful fish swimming in every direction, as well as the beautiful coral that it is well-known for. Keep an eye out on the ocean floor so you can spot ‘I heart Bora’ written in coral! It’s no secret that most people would associate French Polynesia with ‘expensive holiday’. While it can be (not going to lie, Bora Bora was anything but cheap), it can also be very affordable. Obviously, visiting Bora Bora and staying in an overwater bungalow for five nights wasn’t exactly budget travel. We knew this part of our trip was going to be pricey, and decided it was worth the splurge. But, did you know that our five nights in Bora Bora cost almost as much as our week and a half in Tahiti and Mo’orea combined? As far as flights are concerned, it doesn’t cost as much as you’d expect to get to French Polynesia. We had a return flight from Sydney to Pape’ete with a stopover in Auckland each way, and this only set us back around $1,100. Considering that it is a solid 6,000km+ journey, that is not a bad price. Our return flight to Bora Bora just from Pape’ete (a whopping 277km) was about $500 in itself! Travelling between Tahiti and Mo’orea is also super affordable – the ferry takes about 45 minutes and costs about $40. Accommodation on these two islands is also very affordable, just like anywhere, really. You can either scrimp or splurge, and there are plenty of options available depending on your budget. So, there you have it – 5 reasons why you should visit French Polynesia on your next trip! Have I convinced you yet?